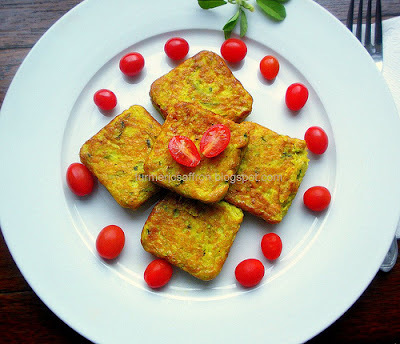 Persian kookoo/kuku is a combination of finely chopped or grated vegetables such as potatoes, herbs and zucchini mixed in with eggs and spices and fried on the stove or baked in the oven. 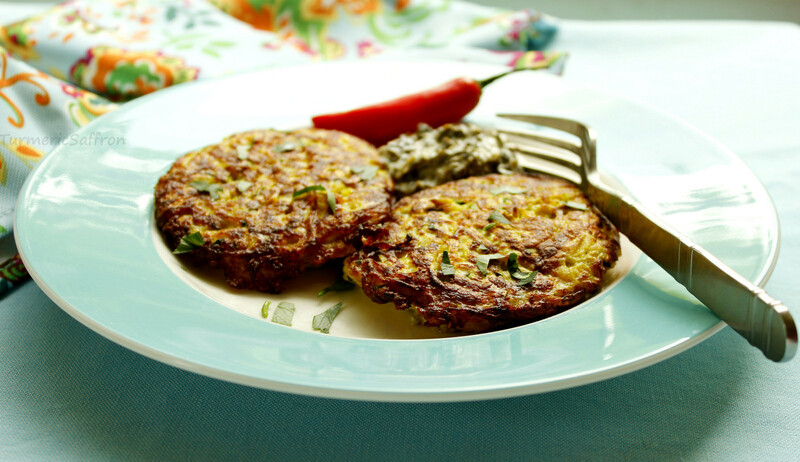 Zucchini kookoo is a healthy, light and tasty dish. 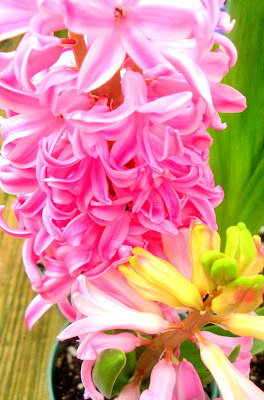 In our home, this is a favorite! It's one of the few dishes that both my kids, who are picky eaters, love and ask for and there are usually no left-overs. Kookoo kadoo may be served as a side dish when serving guests but I like to serve it with some fresh and crisp salad, a dollop of yogurt and some warm pita bread. 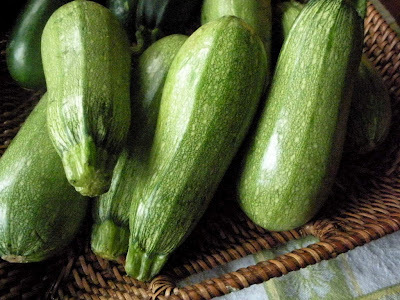 Sprinkle the grated zucchini with salt and let sit in a colander for 10-15 minutes and squeeze out the excess water. In a large mixing bowl combine zucchini, onion, garlic, flour, turmeric, salt, pepper and the eggs. Mix thoroughly. In a large frying pan, heat 3 tablespoons of vegetable oil over medium-high heat. Scoop the mixture using a large spoon and carefully place into the hot oil and fry on both sides until golden brown. You can also pour the mixture in a greased ovenproof baking dish and bake for 30-40 minutes at 375 degrees Fahrenheit preheated oven until kookoo is completely set. I used a non-stick square muffin pan. Has it ever happened to you that you have all the necessary ingredients to make a delicious meal but instead you don't know what to cook and are not inspired enough to cook up something new! These are the times you call your mom, sister, friend, or even a neighbor and ask for their opinion. We need suggestions and helpful comments as to how to do our hair, what to wear to a wedding, what color purse matches our outfits and so on. In my case, several days ago I was looking at a 5 pound bag of organic carrots and wondered about the possibilities. In our home we almost have a set menu that everyone is more or less OK with. There are things that I may make several times a month and then there are those dishes that I rarely make for no special reason and dishes that include carrots are among them. When it comes to carrots, we prefer to eat them raw. There's usually a plate of sliced fruits and vegetables such as carrots, celery, broccoli, apples and oranges on our kitchen table at all times. I needed some inspiration to make something different and new with them. So, I decided to put the question to the fans of Turmeric and Saffron's Facebook Page. That's a community that I'm so grateful for and appreciate to be a part of. 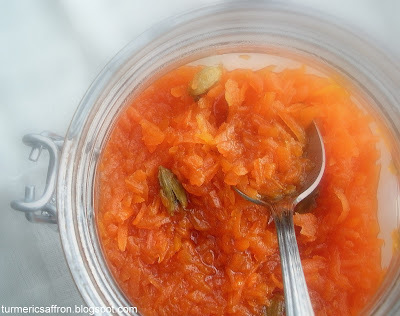 There were wonderful responses but the idea of making a مربای هویج Persian carrot preserve with cardamom as suggested by one of the fans had me so excited that I decided to give it a try! You can either cook carrots, water and sugar together from the start, or first cook the carrots lightly to soften them a little. However, for me, softening the carrots is not an issue since we are used to eating them raw. 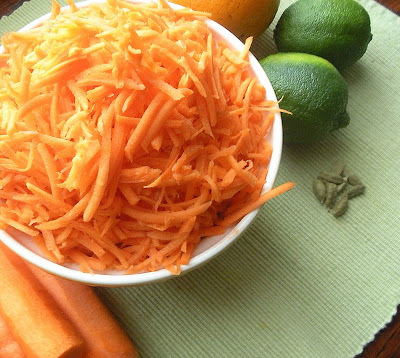 Place shredded carrots and two cups of water in a large heavy-bottomed pot, bring to a boil. Cook over medium-high heat for 8-10 minutes. 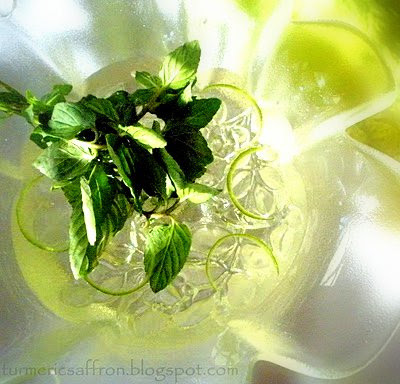 Add sugar, cardamom, lime zest and lime juice, stirring frequently until sugar is completely dissolved. Reduce heat to medium-low and continue to cook for about 40 minutes or until syrupy. In the last 5 minutes of cooking add rosewater, stir and cover the pot. Transfer jam into a clean, sterilized and dry glass jar, close the lid tightly and let cool completely, refrigerate. It may seem too early to talk about Spring cleaning when the ground is covered with snow and the weather is freezing where I live. 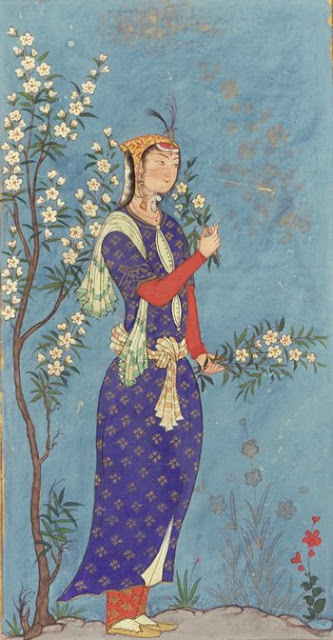 However, there are only four weeks left until the Spring equinox when the days and nights are of equal length and the start of Persian New Year and the celebration of Nowruz (New Day)! Before the actual Nowruz celebration, festivities, family gatherings and all the visits (did-o-bazdid-e Eid) begins, there's the extensive top to bottom, thorough and all-out spring cleaning (khaneh- tekani) that has to take place. This ritual is for everyone and every household, whether one lives in a simple room with minimal furnishings or in a palatial mansion filled with luxurious items! This once a year cleaning ritual is more than the typical routine of vacuuming, mopping and dusting that we normally do. In our home, like the homes of many Iranians, the process of Spring cleaning starts weeks before the Nowruz celebration, so by the time Nowruz arrives (sal-e tahvil), the house would be sparkling clean, organized and neat, the children dressed in their new spring clothes and the Haft-Seen table (table with items starting with the letter "S" each symbolically representing, health, happiness and prosperity), would be beautifully set. Growing up in Iran, this was one of the best times of the year. My mother's ritual of spring cleaning would start with going through all the closets and chest drawers one by one. She would take everything out, get rid of the old and worn out clothing, put the winter clothes away and neatly return the "good" clothing. Then she would clean the rugs, draperies, shades, windows, refrigerator, stove, kitchen cabinets and appliances. Not to mention, the occasional fresh coat of paint for the living room and dining room and the re-upholstery of some of the chairs where we usually entertain and greet family and friends. These are a few rituals, among many others, that take place in preparation for the Persian New Year. These processes are also a symbolic reminder to take in the spirit of Spring and clear our hearts and minds and let go of grudges and hard feelings that we might have accumulated and try to start the New Year with a new attitude and positive outlook on life. I personally find the خانه تکانی Spring cleaning activities joyous and look forward to cleaning every nook and cranny in my house and to let go of anything that I have held on to over the years. It's time for me to carry on the tradition, as my mother kept it together after the loss of my father and my only sister. She welcomed the Nowruz celebrations with joy, and I too shall do the same without my mother's presence. Is there ever a time to overcome your loss? I take in the fresh new air of the coming New Year and am working on the challenging task of being in the moment with every breath. Enjoy your Spring Cleaning and have fun with it! 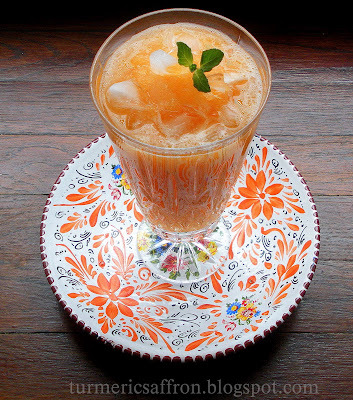 This is a refreshing and nutritious drink made with ripe and sweet cantaloupes and is a superb thirst quencher. 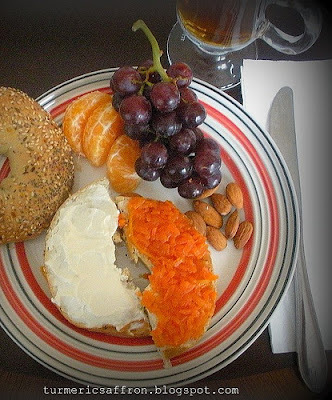 Cantaloupes are great especially when served in the morning for breakfast. It is also wonderful to set up a beautiful tray of sliced cantaloupe and honey dew along with watermelon during scorching hot summer days or any other day of the year while they are in season. In our home, like the homes of most Iranians, having fresh vegetables and fruits on a daily basis is a must and cantaloupe is one of the fruits/vegetables that we buy in large quantities when available. 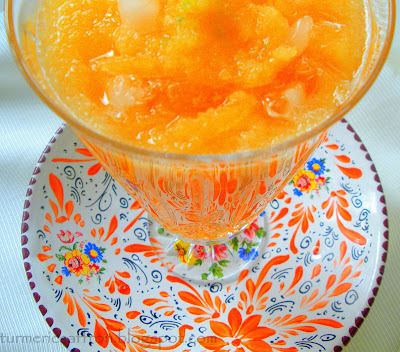 Paloodeh, not to be confused with faloodeh (Persian frozen dessert), is made with pureed cantaloupe, sugar, water, and an optional rose water served chilled. Wash and clean the cantaloupes, cut them in halves, remove the seeds, peel the skin off and cut into small pieces. 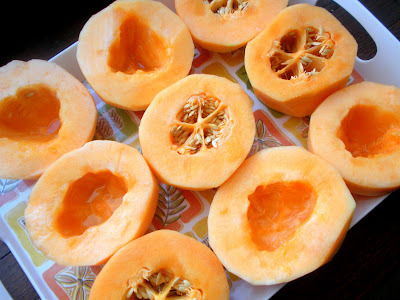 Place the pieces of cantaloupe into a blender, add sugar, water and rose water. Cover and blend until smooth. It would be nice to leave some little pieces in to give it some texture. Pour into a pitcher and chill for an hour or two. Serve chilled or with crushed ice. 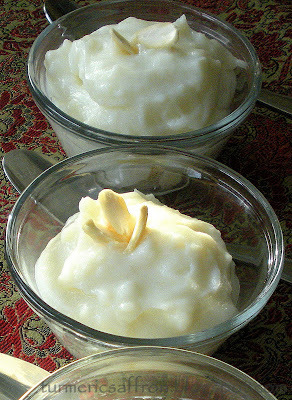 فرنی Fereni is a soft, creamy and sweet dessert made with rice flour, milk, sugar and rosewater and is very comforting for the cold winter days. My mother was born in the western city of Hamadan, Iran, which was known for its Alvand Mountain (kuh-e Alvand), historical background, many tourist attractions as well as its very cold winters. Hamadan is one of the oldest cities in Iran. When my mother married she moved from one of coldest and oldest cities in Iran to one of the hottest areas in the country with new constructions and developments due to the oil industry. She brought her love of Baba Taher poetry with her, some of Ibn Sina's knowledge about herbal medicines and Hamadan's cold weather foods. 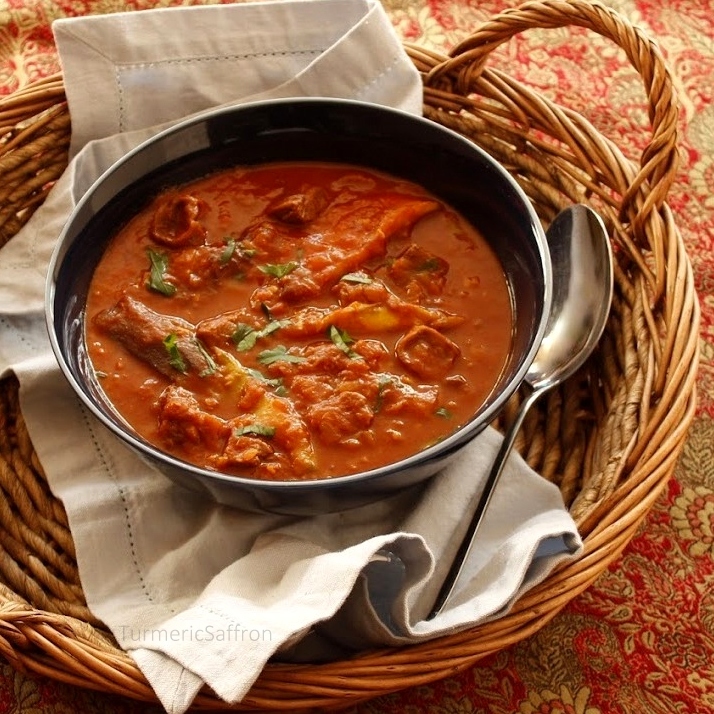 Foods that are meant to warm you up and soothe you came from my mother's side. 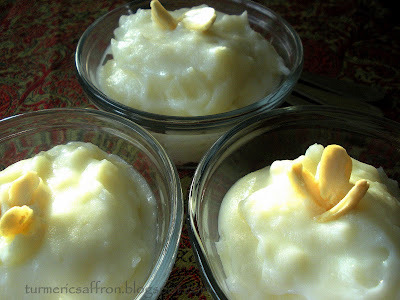 This is yet another wonderful dessert made with rice. 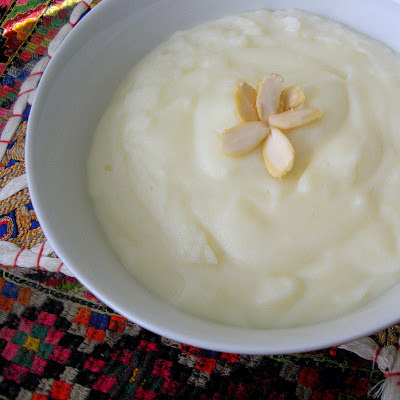 Unlike the other rice desserts that are cooked with rice grains such Saffron Rice Pudding (Sholeh Zard) and Rice Pudding (Shir Berenj), Fereni is made with rice flour.The cooking time may take about 20-30 minutes or until all the ingredients are all well blended, well cooked and thickened. However, Fereni needs a good stirring while cooking on the stove, otherwise it will turn into lumps. Fereni, like many other delicious Iranian foods, doesn't need any garnish but decorating the food and making it pleasing to the eyes is also very important. Of course, this may vary from household to household. In our home, my father enjoyed an elaborately garnished and well presented dish just as much as he cared for the taste. On the other hand, my mother couldn't be bothered with food presentation after raising a bunch of loud and hyper kids (excluding me of course!) 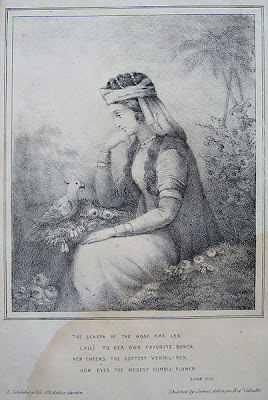 Many times she would bring the pot of stews (ash and abgusht) right from the stove to the table. That may be why I go back and forth between making the food look pretty or just leaving it on the stove for everyone to serve themselves! In a bowl add 2 cups of cold milk to the rice flour and let it soak for at least 1/2 an hour before cooking. In a heavy bottom pot, bring the remaining milk to a gentle boil, add the flour and milk mixture and lower the heat to medium-low. Give it a good stir. Mix in the sugar and stir frequently. Cook for about 20 minutes, add the rose water and cook for an additional 10 minutes. Serve in a large bowl or small individual size bowls. Garnish with crushed pistachios or slivered almonds. Fereni may be served warm, cold or at room temperature. What could possibly be the best gift to give or receive on Valentine's Day? There are numerous possibilities out there, from a card with a handwritten personal message to a box of gourmet chocolates, a bouquet of pink or red roses, a delicious dinner, or some heart shaped jewelery. The list is long depending on one's creativity and of course, the budget. I have to say that the reddest of roses and the darkest of chocolates have always worked for me! Now, since I don't have a special recipe intended for Valentine's Day, I'd like to tell you about one of the best love stories and share a poem. This is a story that never gets old. Perhaps because it touches our hearts and souls. Why do we enjoy hearing and reading about love stories? Why does it bring out such emotions in us? Is love the affair of the heart or the brain? has left its trace on me. May your every breath be filled with love! 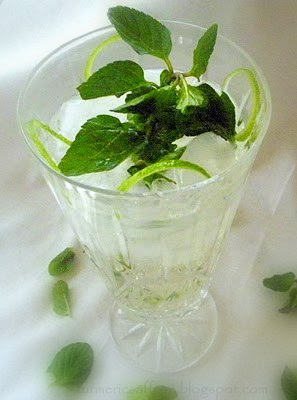 سکنجبین Sekanjabin is one of the oldest sweet and sour syrups in Iran, dating back to the ancient times. It's a combination of vinegar (serkeh) and "angabin," which refers to honey and the natural honey sweet. 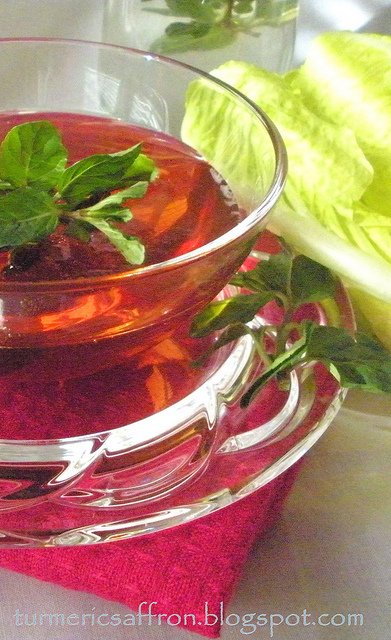 Sekanjabin and its drink (sharbat-e sekanjabin) are usually served during the summer. 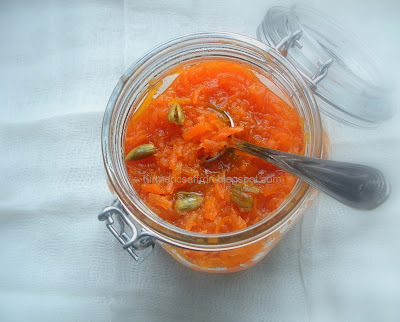 Now, the reason that I'm writing about a well-known ancient syrup that's perfect for the summer time in the middle of winter, is because of a reader's request asking if I had a recipe for sekanjabin a couple of weeks ago. Being from the south of Iran where summers are long and hot, eating sekanjabin and lettuce was an afternoon ritual in our home. Usually, my mother would place a bowl of sekanjabin in the middle of a large round tray, surrounded by several heads of fresh and crisp lettuce in the middle of the table or on the picnic blanket under the shade of a tree, where we would take a piece of lettuce and dip it into the bowl. Almost every time we had sekanjabin we were reminded by our mother that sekanjabin is not just food but it also has medicinal values with healing powers and a good source of vitamins. Of course, back then she would make sekanjabin with homemade grape vinegar. There are many different recipes for sekanjabin/sekanjabin. Some like it more on the sweet side and some like it more sour, it all depends on your taste. In a heavy-bottomed pot combine sugar and water, place on medium heat, stir until sugar is dissolved. Reduce heat and gently boil for 10-15 minutes. Add 1/2 cup of vinegar, simmer for 30 minutes or until the mixture slightly thickens. Taste and adjust the level of sweetness of the syrup. I usually add an additional 2 tablespoons of vinegar since I like it a bit more on the sour side. 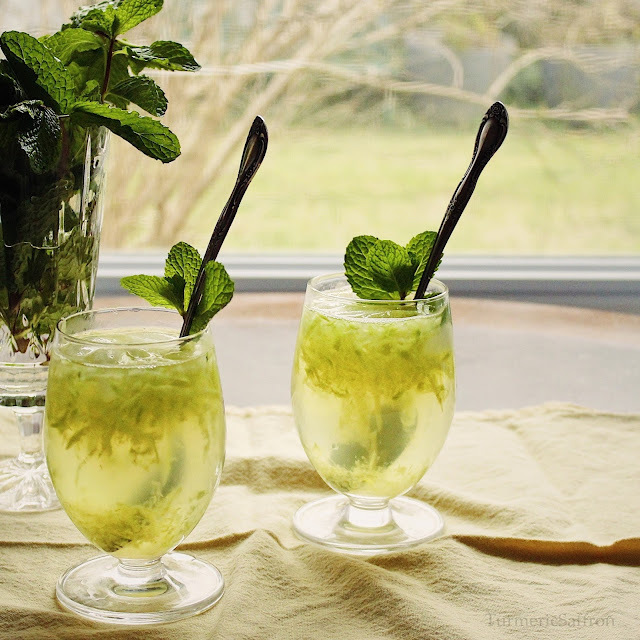 In the last couple of minutes add a small bunch of fresh mint to the syrup. Remove from the heat and let cool completely. 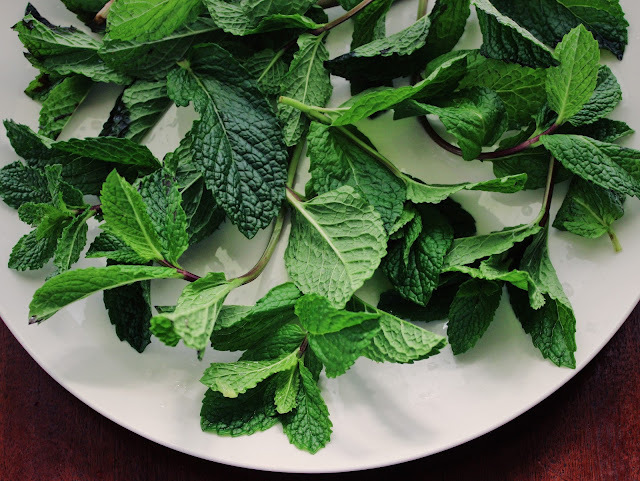 Remove the mint leaves before serving. Pour sekanjabin into a small bowl and serve with fresh lettuce on a platter. Just to remind you, sekanjabin is quite sticky! Place a couple of tablespoons of the syrup in a glass, add some ice, water, shredded cucumber, mix well, garnish with fresh mint leaves and lime rind. 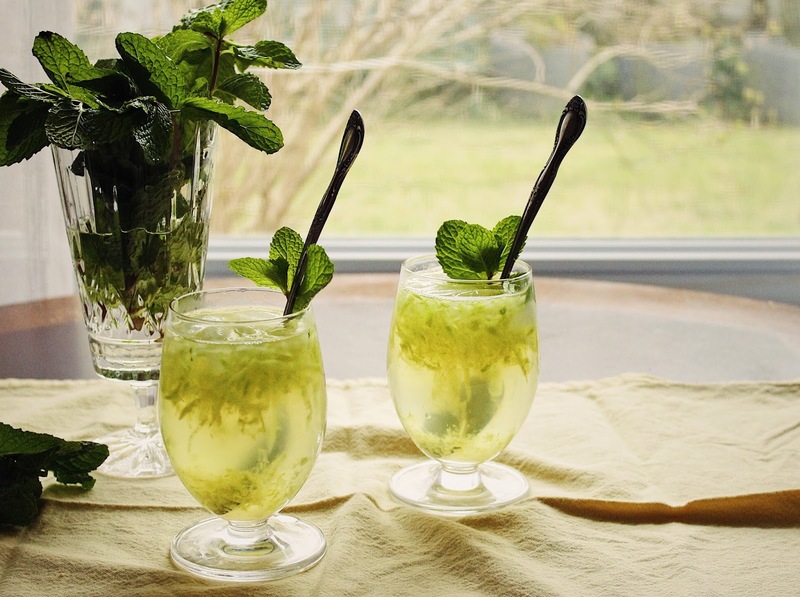 Follow the same directions used in recipe #1 for sekanjabin and its drink (sharbat). Remove the foams with a spoon as they form on top. Taste and adjust the sweetness. The aroma of the honey gently simmering on the stove fills up the entire house and is quite intoxicating! 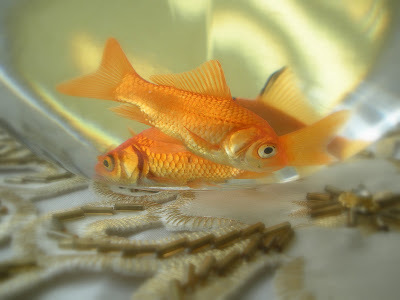 Sekanjabin can be preserved in a glass jar and kept in a cool place for a long time. 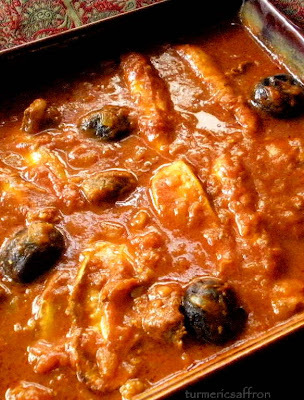 In the Persian cuisine there are a number of tasty, slow cooked stews (khoresh/khoresht) that combine the seasonal vegetables with either meat or chicken. Iranian food is not heavily spiced and in order to achieve the optimal taste, some patience, time and planning is required. I usually buy the needed ingredients a day in advance and take care of some of the things that could be done ahead of time without jeopardizing the freshness of the food. There are those that have their onions thinly sliced (an essential part of Iranian cooking), fried, packed, sealed and frozen for when it's needed. Same goes with fried eggplants and herbs. And there are those that even have a herb and bean stew (ghormeh sabzi) ready to be served in their freezer for that guest that might drop by unexpectedly! We grew up where going to a family member or friend's house didn't require an invitation or a prior notice, even a phone call wasn't necessary. This dish خورش کدو khoresh-e Kadoo is usually made with the summer squash called zucchini/courgette, the long and green zucchini which tastes wonderful. Yet, since I've discovered the gray squash in my local Italian vegetable store, which is a town over, I've made the switch at least for now. I find this kind of squash to be more firm and tastier and they are the perfect size also, just cut them in half, lengthwise. This dish can also be made without meat. Heat 3 tablespoons oil in a frying pan, fry the squash slices over medium heat until golden brown on both sides. Set aside. Heat 2 tablespoons oil in a pan, saute sliced onions over medium heat until translucent, add the turmeric powder and garlic, stir and saute for another five minutes. Add the meat, brown on all sides, add salt and pepper. Add the tomato paste, cook for five minutes, add the tomatoes. Add water to cover the ingredients by a couple of inches and add limoo amani. Bring to a rapid boil, lower the heat to medium low, cover and cook for an hour or until meat is tender. Add water if needed. If you are using lemon juice, add it after the meat becomes tender. In an oven-proof dish, place half of the meat sauce and add a layer of the fried squash, repeat. Taste and adjust the seasoning, cover with a foil and cook for 40 minutes in the 350 degrees Fahrenheit preheated oven. Serve warm with some white basmati rice, yogurt, salad and herbs. As food nourishes our bodies, satisfies our hunger and sustains us, poetry, music and rhythm feed our soul and bring joy to our hearts. I grew up appreciating and enjoying poetry. Maybe it's in my DNA passed down from my mother to me or just because I grew up listening to poems, reading poetry and memorizing them at school like the majority of Iranian kids. Now, in addition to my recipes and food from my culture, I would like to occasionally share a poem with you all. Today's poem is by Mowlana Jalal-al-Din Rumi (1207-1273). 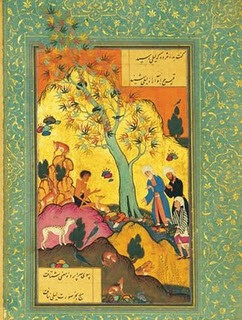 This is the first poem from the first book of Masnavi. None can see and none can hear. And mingle all his love with mine! "Tis the wine of Love that inspired me. Hearken, Hearken to the Reed!" 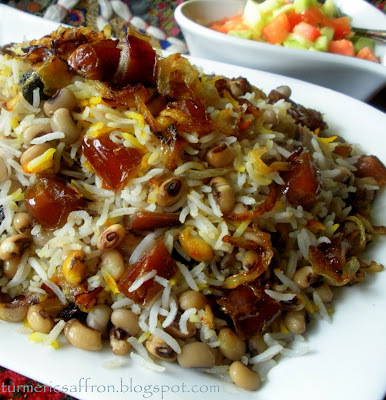 لوبیا چشم بلبلی پلو Rice with black-eyed peas (cheshm bolboli) is one of many Iranian rice dishes and "cheshm bolboli" means nightingale's eyes in Persian/Farsi language. This may not be as popular or as presentable and festive looking as some of the other rice dishes, but it's a tasty vegetarian dish to make for a Sunday afternoon light lunch with close friends. It may also be served with lamb, or chicken too, but I like it by itself with some salad, yogurt or pickles. Whenever I make this dish it brings back memories of home. Place black-eyed peas in a pot, cover with water and bring to a boil over medium high-heat. Reduce the heat to medium-low. Cover and cook the beans for about 40 minutes or until tender. In the meantime, in a non-stick pot bring 6-8 cups of water to boil, add rice and boil for 10-15 minutes or until the ends are soft and the center is still a bit firm. In the last five minutes, gently scoop in the cooked beans to the boiling rice and let the rice and the beans boil together for 5-7 minutes. Drain in a colander and rinse gently with cool water. Wash and clean the pot, add 3 tablespoons of oil to the bottom, add rice and the beans, place the pot on the stove on medium heat. When you notice the steam come up, pour 2 tablespoons of oil,1/4 cup of water and the liquid saffron. Put the lid back on tightly. You may wrap the lid in a towel to prevent the moisture from going back in. Cook for 45-50 minutes. In a small frying pan, melt 2 tablespoons of butter, saute onion until brown, add raisins and dates, saute for 3-5 minutes. To serve gently spoon rice into a serving platter, garnish with dates, raisins and caramelized onions. *Variation: you may add 1/2 cup of dried dill to the rice and beans.